Halloween is my favorite holiday. I usually start thinking about my costume in July and start assembling and figuring out over the next coming months. This year I decided to be a donut queen, because, after all, I truly am a donut queen! I love all donuts. I crave them constantly but I’m also picky for the perfect donuts. My favorites in the valley would have to be Local Donut, Bosa Donut, and Rainbow donut. With my costume this year, I wanted a fun dessert to go along with it. I could’ve just brought a dozen donuts and called it a day. But that’s boring and I wanted to do something more fun. I had several Halloween parties this weekend, so I needed something that A) was related to my costume B) would make a lot and C) would be easy to make. First, prep your ingredients. 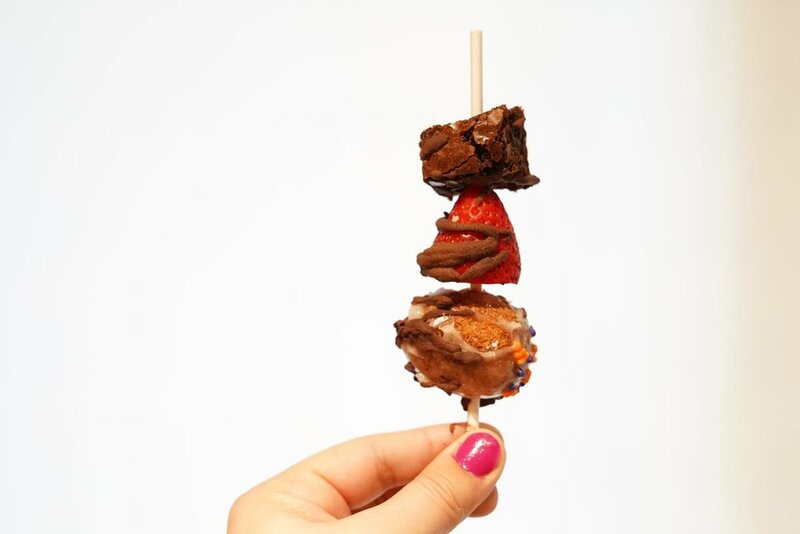 Slice the tops off the strawberries, cut the brownies into small cubes. Create your assembly line with bowls of each skewer ingredient. Pull out a parchment paper working area or cookie sheets. 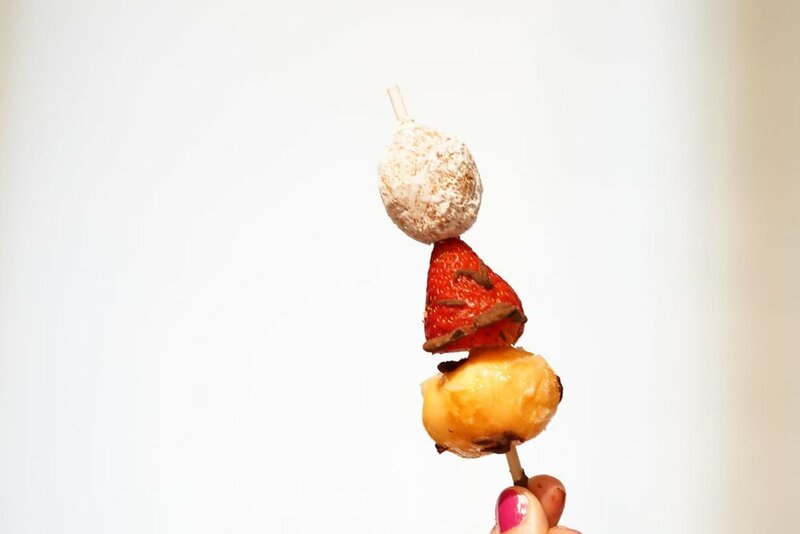 Take one treat stick and assemble donut hole, strawberry, brownie. You can also do donut hole, strawberry, donut hole, or whatever pattern you like. Temper chocolate. Melt chocolate with butter using double broiler or microwave. If the consistancy is too thick, add more butter or a splash of milk. The chocolate should be slack enough to drip but still hold its form. Take a fork and dip it into the chocolate. Move it vigorously back and forth over the skewers to create a drizzled effect. Let the chocolate set for 10-15 minutes, and enjoy. Play with different donuts and patterns!